Formation riding, more formally known as quadrille dressage, is a competitive equestrian sport. Groups of riders perform choreographed maneuvers, usually to music. It is similar to drill team. A minimum of four horses are used, although additional pairs can be added to the team. At the highest level, teams perform intricate maneuvers in complicated shapes on the field. Matching horses and uniforms, upbeat music and clever synchronization make formation riding an incredible sight to behold. This sport has been adapted by Windy Acres Ranch to work well within the limitations of the game. The terminology has been simplified and changed to make it easier to remember. Most maneuvers are performed at a walk, with the canter used to adjust positioning as needed. Training sessions take place on a field with a clearly marked border. The ideal team has four members, a drummer, and at least one backup rider. After learning the basics, riders can perform in groups of six to twelve. Contact Kiralynn in-game to sign up. Each maneuver has a diagram to illustrate how it should be performed. It is important to learn the terminology and print out the maneuver diagrams before training begins. Click here to view the diagrams. The glossary, formations, and other resources can also be found at the end of this article. A number of emotes may be used during a performance, including Cheer, Hail, Salute, SwordSalute, and Wave. Other emotes that are useful for mounted roleplay include Calm, Laugh, LookAround, and Shakefist. It is very useful for participants to purchase the horse emote MountRearUp. The MountBow emote also enhances a team member’s performance. Formation riding at a walk works best with fast (+68%) horses. These include steeds of Bright Days, Cave-Claw Masked, Dusk Watch, Elf Ambassador, Eriador, Jester, Minas Ithil, Night, Noble Grey, Painted Skeleton (glowing green), Treasure Laden, class horses (Guardian, Hunter, Champion, Rune-keeper, etc) and War horses (Dunedain, Isengard, Ost Dunhoth, Galadhrim, etc). The Apprentice Riding trait can be used to boost all standard steeds to +68%. The Journeyman Riding trait accelerates them to +78%. The beginner’s team meets Tuesday evenings at 9:30pm /server at the Horsefields arena near the Bree festival grounds. The advanced team, which rides war steeds, meets on Wednesdays at 9:30pm /server at the farms at the back of the Rusham neighborhood of the Shire. Optional practice sessions are occasionally scheduled on Saturday at Noon server time. Two riders are required for basic drills. Four riders are needed to practice for performances. Please hide any cloaks, quivers or packs that you might be wearing. 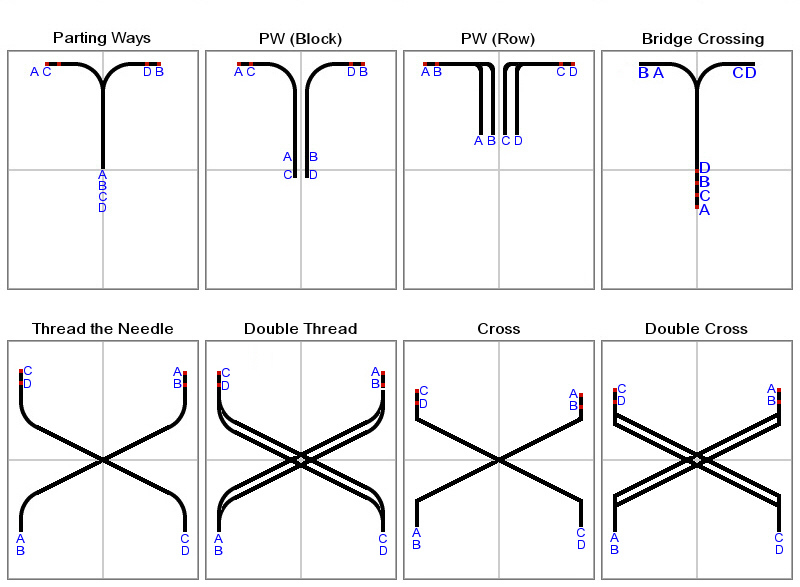 This will make it easier for other riders to find their proper spacing in relation to you. If possible, wear a simple outfit in black and navy. Riding outfits can be provided if you have wardrobe space available in your bank. Bring a plain horse, preferably a chestnut. Bay, blood bay, blonde sorrel, and liver chestnut horses are also good for practice. Dark chestnut, Eglan, and Esteldin horses can do in a pinch. We will ride horses with fancier tack during performances. Keep your maneuver diagrams handy so that you can refer to them during practice. Like any sport, formation riding takes a lot of practice. You will learn the maneuvers quickly, but it will take many repetitions to perfect your spacing and positioning. Each rider will learn to perform maneuvers individually and then in a group. It is important to develop confidence in your riding skills so that you can ignore lag, move properly even if the rider next to you is out of position, and complete an entire routine. Formation riding may seem difficult at first. Be patient with yourself – you can do it! Let your team captain know which mounts you have in your stable. If you are on the Windy Acres Ranch team, send an email to Kiralynn with a list of your standard and fast mounts. Check the team roster to make sure your entry is correct. The Insert key toggles you between Run and Walk modes. If you become out of sync with your steed, press the Insert key twice in a row while your mount is in motion. Your animation is out of sync when you appear to bounce up and down in the saddle. If you fall behind the rider in front of you, use a brief burst of Run mode to catch up. In the Horsefields, the center line is an imaginary line drawn between the light posts to either side of the field. Do not judge the center based on the dirt path – it is crooked. Each rider has a letter designation, A through D. Letters are used to label the approximate starting position of the horses. (The exact starting position depends upon the transition from the previous maneuver.) A single starting line indicates that the riders start in a column, two lines indicate a block, and four lines indicate a row. The end positions are indicated by red dots. A rounded line indicates a turn. A sharp angle with a diagonal line indicates a strafe. Most of the maneuvers can be done in reverse. Each rider may have a new letter at the beginning of the next maneuver, depending on his starting position. The distances are approximate and may need to be adjusted based on the actual length and width of the field in the game. 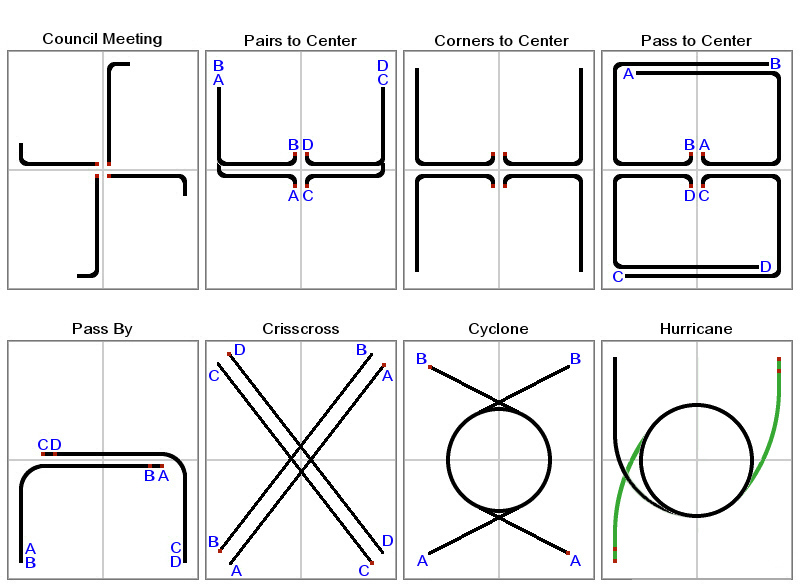 Click here for a printable version of the maneuver diagrams. On routine maneuver diagrams, there are often little symbols in the corner of a maneuver. These include circles, squares and triangles. One of them will be filled in. These are position markers. A square indicates a corner post on the stone wall of the Horsefields. A circle indicates any other post. 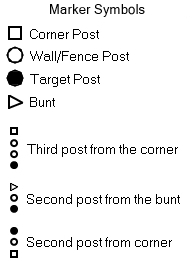 A triangle indicates a bunt, one of the decorative cloths hanging from a pole mounted on a brick post. The filled circle is the target. 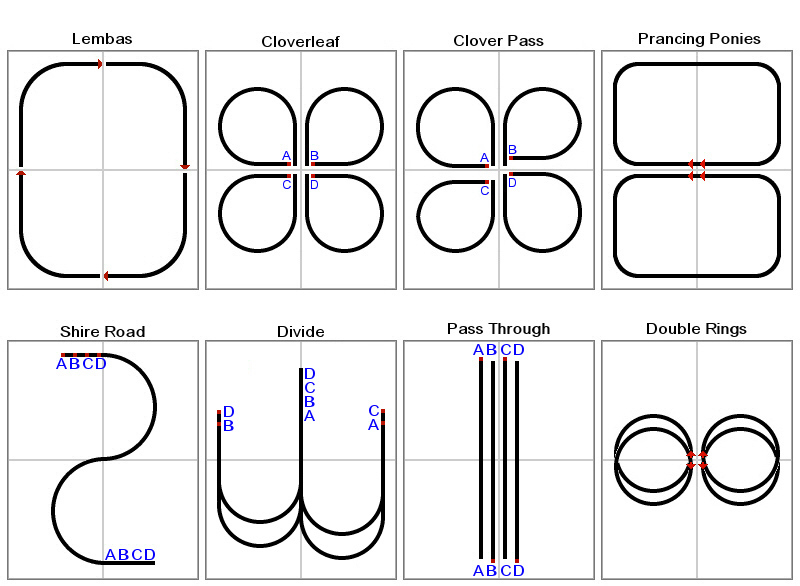 For example, if the diagram shows a turn, there is a square with two circles, and the second circle is filled in, the turn should occur when the rider is lined up with the second post from the corner. If the diagrams don’t make sense to you right away, don’t worry. It’ll all become clear once you see them demonstrated on the field. Think of it a bit like line dancing. Once you get the hang of it, you’ll be riding like a pro! Block – A formation of four riders, organized into two rows of two. Canter – The third speed of a war steed, or a standard steed at a run. Center Line – An imaginary running east-west through the center of the riding field. Column – A formation of single-file riders arranged nose to tail. Diagram – An image that shows how a maneuver should be performed. Drummer – A musician that plays a tempo which helps the riders coordinate their movements. East Line – An imaginary line along the eastern edge of the riding field, about 5′ feet from the border or wall. Entry – The team rides onto the field in column or wide column formation. Fast Horse – A 168% (+68%) horse or pony, such as a class mount. 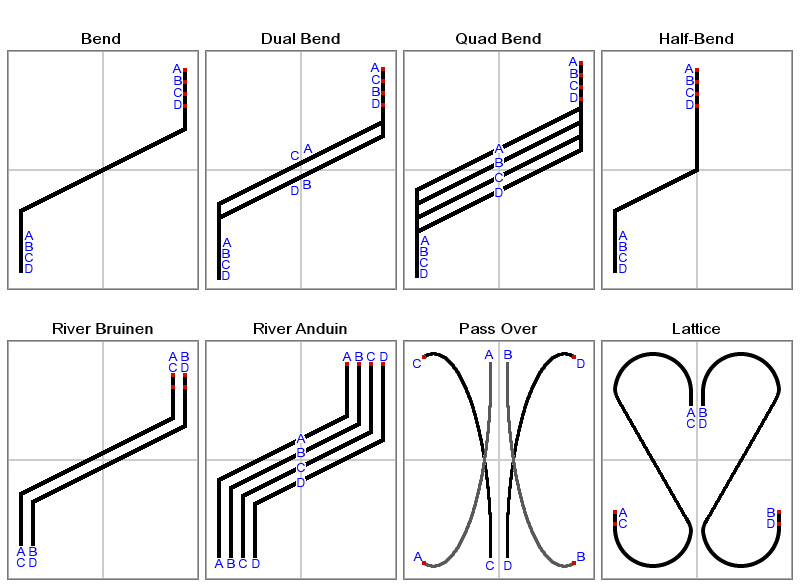 Figure – A geometric path – straight line, circle, figure-eight, serpentine, or turn. Formation – One of the standard ways in which riders can be aligned – block, column, row, solo, tight row, wide column or wide row. Gallop – The fourth and fastest speed of a war steed. Standard steeds do not gallop. Out Of Sync – The upward movement of the horse and rider occur at different times, making the rider appear to bounce in the saddle. Maneuver – A short series of coordinated movements that either cause the riders to change formation, or require the formation to ride in a figure. 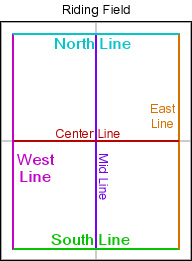 Mid Line – An imaginary line running north-south through the center of the riding field. North Line – An imaginary line along the northern edge of the riding field, about 5′ feet from the border or wall. Routine – A series of maneuvers and transitions that comprise the team’s performance. Row – A formation of single-file riders arranged side-by-side. Salute – The team transitions from column or wide column into row formation and presents themselves to the audience. Tight row is used for more than four riders. After the transition, a Mountbow, Salute, or SwordSalute is traditionally performed to greet the audience. Solo – A single rider performing figures alone. South Line – An imaginary line along the southern edge of the riding field, about 5′ feet from the border or wall. 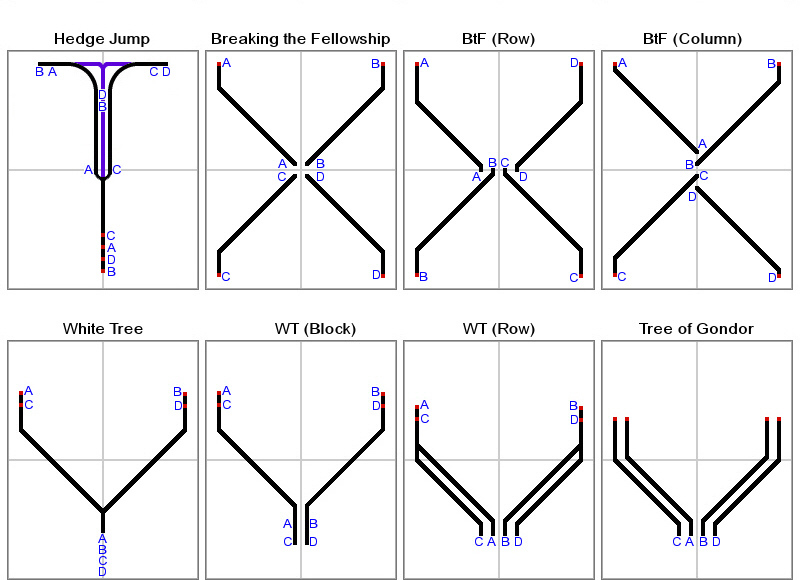 Spacing – The distance between two horses. Proper spacing is one horse length between steeds. Staging – After entry and salute, the team moves into the first formation of their routine. Standard Horse – A 162% (+62%) horse or pony, such as the basic horses which can be purchased at Hengstacer Farms. Strafe – Riding diagonally, typically accomplished by pressing the Q+W or W+E keys simultaneously. Team Captain – The player with the greatest responsibility for organizing the team. A captain typically schedules training, choreographs routines, and makes sure all members know which outfit and horse to bring to a performance. Tight Row – A row of horses with less than 5′ of spacing between them. Transition – Moving from the end of one maneuver to the starting point of the next. Trot – The second speed of a war steed. Standard steeds do not trot. Unit – A group of four riders that perform maneuvers together. Walk – The slowest speed of any steed. War Steed – A variable speed horse earned by questing in Rohan. West Line – An imaginary line along the western edge of the riding field, about 5′ feet from the border or wall. 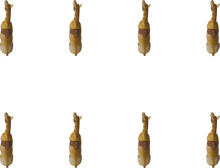 Wide Column – A formation of eight riders in side-by-side columns of four. Wide Row – A formation of eight riders, with one row of four in front of another. Click here to watch a video of the formation riding team in action. 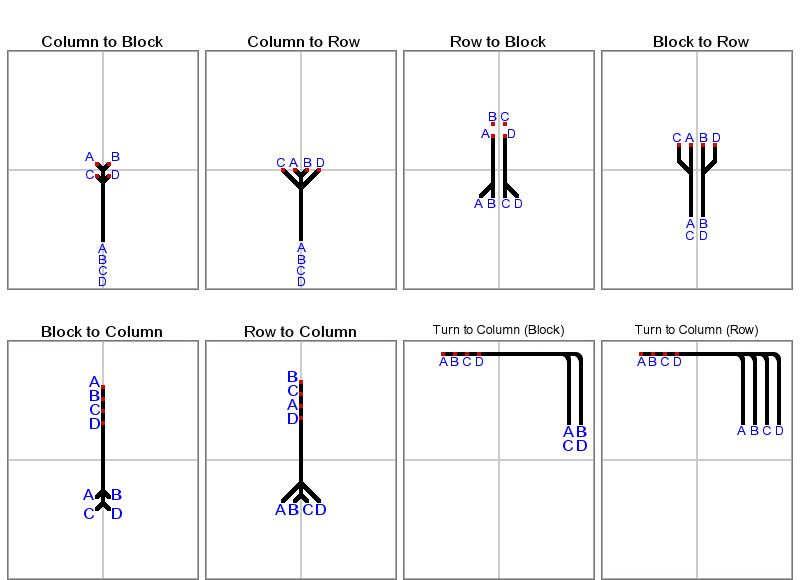 Click here to see a PDF routine maneuver diagram used in the video.